Referred to as “one of the most important and influential female artists of the past 30 years” by MoMA on the occasion of her retrospective at the museum in 2013, Isa Genzken‘s new work is the subject of Hauser &Wirth’s current solo exhibition in London. Less known in the States compared to her artistic influence and recognition in Europe, Genzken has pursued a notably progressive career in the recent decade, building new bodies of work and showing in various international venues. Entitled Geldbilder — translating as money pictures — the twenty-five works on view at the gallery’s London location reflect Genzken’s investigation on capitalist ideology and money as its ultimate emblem. Genzken, who has never been hesitant in introducing raw, discarded and ephemeral materials in her work, builds her new series as a territory for juxtaposition of consumerist desires and the unachieved ideals they often lead to or incorporate. 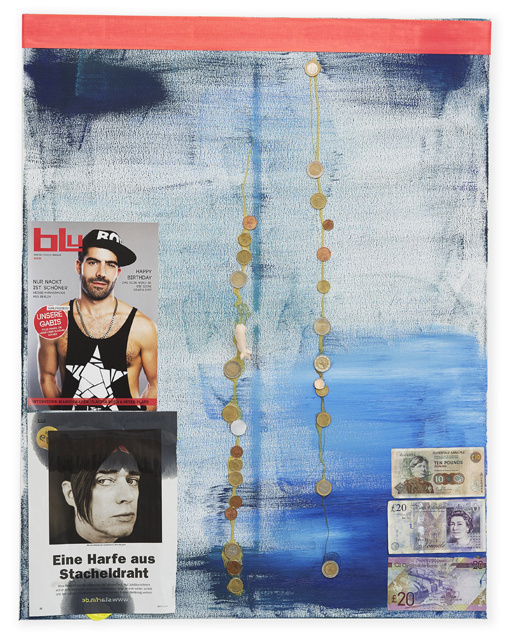 Collage, as a tool for marrying detached or familiar objects on singular surfaces, allows the Berlin-based artist to compose open-ended narratives on canvas. 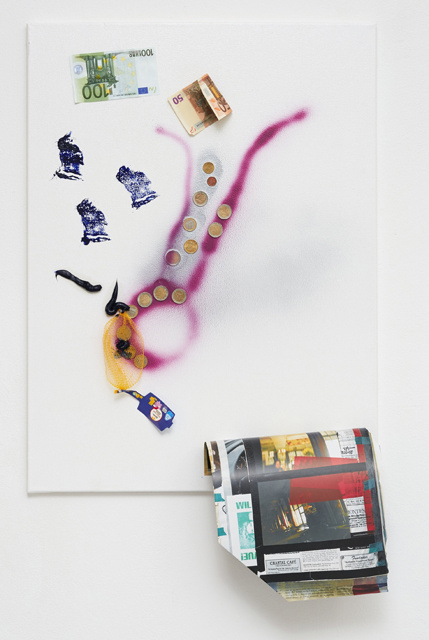 Bills and coins play akey role in her arrangements, negotiating with a group of found objects, from photographs of herself, found flyers and broken glasses among other objects, all accentuating and supplementing her arguments. 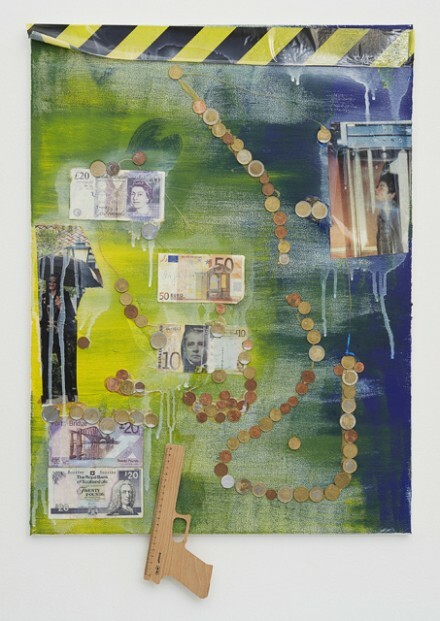 Genzken, whose artistic discourse has embraced an expansive variety of mediums and genres throughout the years, here repurposes money, eliminating its authoritarian charge as a signifier of power and class. 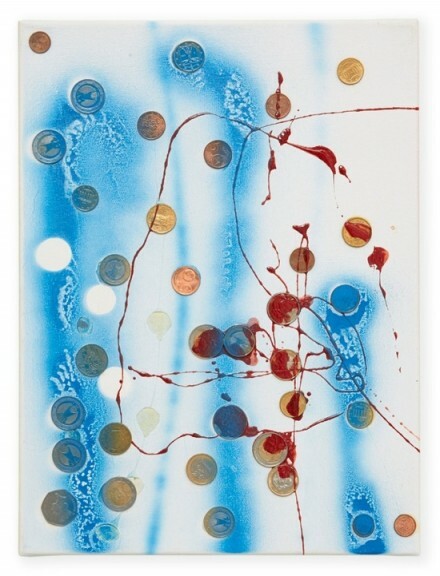 Currency references run through the visual systems of each composition, Genzken seems intent on wiping these objects clean of their commodity implications, and leaving only the currencies themselves as visual objects. The Queen of England on a £20 note, for instance, is played off against a photo of Genzken herself or a cover of German gay magazine, fusing into one aesthetic hierarchy that prioritizes neither while working on each visual element in equal measure. Histories and narratives are conjured by each piece’s respective elements, often using concrete physical and political signifiers in conflict or congruence with less specific visual elements to imply certain aspects of European history beyond its hard currencies. As an artist whose works have continuously raised in value throughout the years, Genzken complicates the methods of valuation within the dynamics of art market, reclaiming money as a piece of commodity rather than being its sole agent. Genzken’s chaotic compositions, on the other hand, hold traces of traditional painting genres, especially Abstract Expressionism, proven by her brushstrokes of acrylic in bright tones of green, yellow or blue. Isa Genzken: Geldbilder is on view at Hauser & Wirth through May 16, 2015. *All images are the Courtesy of Hauser & Wirth, London. This entry was posted on Tuesday, May 5th, 2015 at 1:57 am	and is filed under Art News, Featured Post, Show. You can follow any responses to this entry through the RSS 2.0 feed. You can leave a response, or trackback from your own site.